The Circus is a 2016 television documentary series following the 2016 presidential race and the Trump administration. It is produced by Showtime and Bloomberg Politics. The docu-series premiered on January 17, 2016, and focused on the 2016 U.S. presidential election, January to November. It was renewed for a second season, which premiered on March 19, 2017, and focused on President Trump's first 100 days. It returned on April 15, 2018 for a third season, and focused on the mid-term elections, with CBS News anchor Alex Wagner stepping in as co-host to replace Mark Halperin, who was replaced on January 3, 2018, by the show, after sexual harassment allegations. The campaigns of three "outsiders" – Ted Cruz, Bernie Sanders and Donald Trump – are given behind-the-scenes attention on the road to the Iowa caucus. This episode follows the angst and drama leading up to the Iowa caucuses, with a showdown brewing between Democrats Bernie Sanders and Hillary Clinton and the GOP's first real test of outsider candidates versus the establishment. From the electric jolt of New Hampshire to the hard truths coming up in South Carolina and Nevada. Trump tastes victory, Kasich picks up momentum – and Bush faces the prospect of an impending do-or-die reality. As the campaigns head towards the final stretch leading to Nevada and South Carolina, there's growing anxiety among both frontrunners and stragglers about just how high the stakes are – and the significance of falling behind. With the field narrowed down to The Big Five, the campaigns spread their game across the country and play to their strengths – with eyes squarely focused on the all-important upcoming prize: Super Tuesday. With big wins for the frontrunners on Super Tuesday the rest of candidates are reckoning with the results. But the biggest story of all might be one both Democratic and Republican establishments can agree on: how do they stop Trump? It's make or break time for Rubio, Kasich and Sanders. As the candidates pin their hopes on Florida and Ohio, can they gather enough momentum to force a brokered convention – or will their campaigns finally run out of steam? While Rubio gets trumped in Florida, the rest of the candidates remain cautiously optimistic. But are high hopes what they need to pull off a win and secure the nomination – or are they just delusional? Ahead of a Wisconsin showdown the candidates crisscross the state in pursuit of competing agendas. Can Kasich, Cruz or Sanders secure their position as spoilers – or will Clinton and Trump finally be crowned their party's Big Cheese? From the early primary battles to the Super Tuesday showdown and beyond, pull back the curtain on the 2016 presidential race with Mark Halperin, John Heilemann and Mark McKinnon – and catch up on the electrifying first twelve weeks. No president is complete without a veep. As Trump auditions Chris Christie, Mike Pence and Newt Gingrich and Clinton considers Tim Kaine, can the candidates find the right-hand man for the job who will make, not break, their campaign? The political circus goes into overdrive as Trump is crowned the Republican nominee – and Melania, controversially, speaks! Capitalizing on his children to help humanize his image, can Trump plus Pence finally rally a unified party? With ten weeks to go until the election the Trump campaign finds itself running from behind. As members of his party start to publicly jump ship, can Trump find a way to close the gap with Clinton or will he just fall further behind? With revelations of Clinton's pneumonia and scrutiny surrounding Trump's medical records, the question of their fitness to lead takes a physical turn. As both campaigns try to punt the issue can the seconds-in-command handle the heat? As Clinton and Trump prepare for the first of their debates, the campaigns target a handful of states that could swing the election. But in the must-win battleground of Florida can either candidate work out a path to gaining the edge? From debate prep to the big night and the flap that follows over Alicia Machado, the script gets flipped as the candidates cede the spotlight to an inside peek into the days and nights of the people who broadcast the news and cover the political sphere. Tracking the fallout from the second debate and the scandal surrounding a now-infamous audio tape, could this be the final nail in Trump's campaign coffin - or can he pull off a surprise October Surprise to rally yet another comeback? Amid claims of foreign intervention, international espionage and widespread hacking, Clinton faces what might turn out to be her toughest opponent to date: WikiLeaks, and the trove of highly sensitive, private emails it's made public. In a special hour-long episode of the real-time documentary series, Mark Halperin, John Heilemann and Mark McKinnon go behind the scenes of both campaigns in the lead up to Election Day - and the fallout that followed. Mark Halperin takes a ride on Air Force One with President Donald Trump. We look at the debate surrounding the healthcare bill and hear from both sides, including Sen. Ted Cruz, Sen. Rand Paul and the White House. Mark Halperin talks with Senator Patrick Leahy about Neil Gorsuch’s Supreme Court nomination, Congressman Adam Schiff weighs in on Trump’s alleged ties to Russia and Joe Biden enters the fray surrounding the healthcare bill. Washington insiders join John Heilemann, Mark Halperin and Mark McKinnon for a look at some of the thrilling, amazing and logic defying acts performed during President Trump's first 100 days. The United States and Russia are locked in a dangerous new standoff. From Facebook and meddling in the 2016 election, to alleged poisoning attacks, to the war in Syria, Russia is the dominant force in our news cycle. John Heilemann, Mark McKinnon and new host Alex Wagner examine America’s new Cold War with Russia and where it’s leading. As Mike Pompeo's nomination for Secretary of State clears a Senate hurdle, official visits from French President Emmanuel Macron and German Chancellor Angela Merkel command the administration's attention. John Heilemann and Mark McKinnon sit down with Wendy Sherman, lead negotiator behind the Iran nuclear deal. Plus, Alex Wagner interviews imam Dr. Ismail Elshikh, the plaintiff behind the travel-ban challenge. The Trump administration has had to contend with an unprecedented number of crises, and spinning them is an ongoing preoccupation. In this era of splintered news media, how do you get the right message to the right people, and still stay on course? Former New Jersey Governor Chris Christie discusses trying to govern during a PR crisis, Steve Brill hosts an Axios event on combating fake news, and Steve Schmidt and Mark Fabiani, Bill Clinton's advisor during the Whitewater scandal, both weigh in on how this White House is managing crises. With the looming midterm elections, the Trump presidency under siege, and Hurricane Florence bearing down on the Carolina coast, Washington has a lot on its collective plate. In the wake of the Kavanaugh confirmation, The Circus travels to California to take the temperature of the political and policy resistance to the Trump administration. With almost a dozen house seats currently held by Republicans in serious contention, any potential blue wave in the midterm elections will begin here. The hosts interview key players from across the political spectrum to determine the current state of California politics, how they got where they are, and where they are headed. This special one-hour finale is all about the midterms: before, during and after. In the run-up to election day, The Circus visits some of the high-profile campaigns to catch their final pushes. On election day, we're backstage and on set at The Late Show with Stephen Colbert, where John Heilemann and Alex Wagner are guests as the results are coming in. Then we cover the fallout of the historic election, from Trump's reaction to the surprising changes to the political landscape in Washington and beyond. ^ "'The Circus: Inside the Greatest Political Show on Earth': TV Review". Hollywood Reporter. 2016-01-18. Retrieved 2016-05-23. ^ Brian Lowry (2016-01-17). "'The Circus' Chronicles 2016 Presidential Campaign on Showtime". Variety. Retrieved 2016-05-23. ^ "Showtime : The Circus : Home". Sho.com. 2015-07-07. Retrieved 2016-05-23. ^ Schwindt, Oriana (2017-02-27). 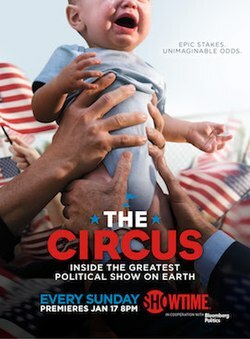 "'The Circus: Inside the Greatest Political Show on Earth' Gets Second Batch at Showtime". Variety. Retrieved 2017-03-03. ^ "The Circus: Inside The Greatest Political Show on Earth: Miniseries". Rotten Tomatoes. Retrieved December 2, 2016. ^ "The Circus: Inside the Greatest Political Show on Earth - Season 1 Reviews". Metacritic. Retrieved December 2, 2016.